Spring fans, we are excited to announce full support of Spring Boot 2.0 on the Spring Boot Starters for Azure, already available on Spring Initializr. Plus, with new Java and Spring extensions for Visual Studio Code you can build production-ready apps and easily deploy them to the cloud. Spring Initializr enables developers to handle the dependency management and make the bootstrapping process for Spring projects much easier. 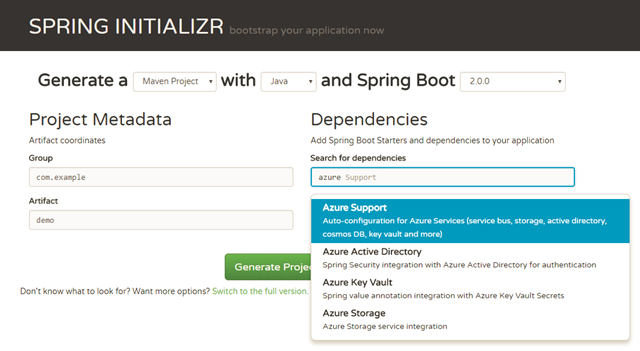 Today, we’re announcing that the Azure Starters have been updated to support Spring Boot 2.0, so you can easily integrate cloud services with your application. Azure Active Directory: Enterprise grade authentication using Azure Active Directory, integrated with Spring Security. Azure Key Vault: Manage application secrets using Azure Key Vault, providing Spring value annotation support. Azure Storage: Integration with Azure Storage, including object storage, queues, tables, and more. 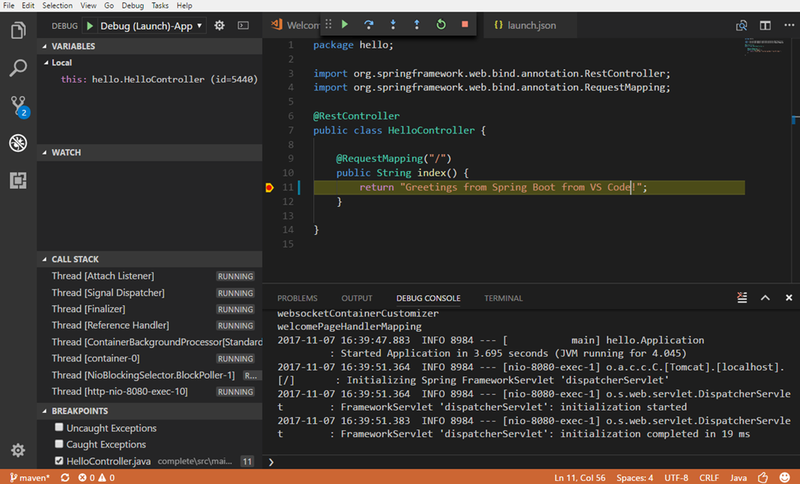 Scaffold a project: You can quickly generate a new Spring Boot project using the Spring Initializr extension for Visual Studio Code, without leaving the editor. Write code efficiently: Use Spring Boot Java Support for smart code auto-completion, quick source code navigation, instant access to view running applications, and real-time display of application information. Better debugging: Use Debugger for Java to set an application source code breakpoint so that browser reloads take you directly to that breakpoint. If you don’t have an Azure subscription, you can get started with our trial offer, including $200 in Azure credits and 12 months of popular services, for free. Check out the Azure Spring Boot Starters page on GitHub to get started. 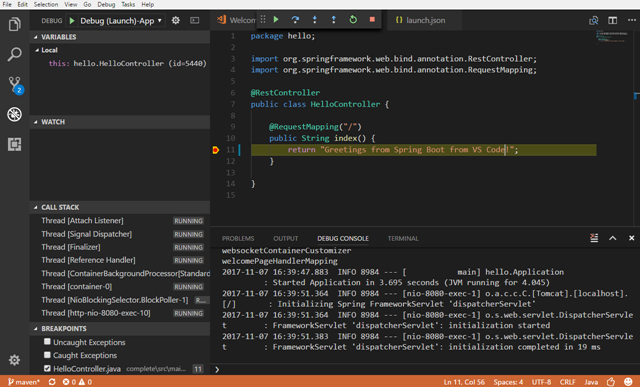 Also, don’t forget to try Visual Studio Code for a faster and leaner experience building Java and Spring apps.